Due to Boeing taking away $6000 in wages and benefits during recent contract negotiations, the machinists at Seymour Johnson Air Force Base, members of IAMAW, have voted to strike. They have been picketing since Monday and will continue to strike until the company puts more on the table. The Boeing machinists have put out a call for solidarity support from the IAMAW District and all Local Lodges in North Carolina. This week, they got a measure of support from outside the IAMAW when farm worker advocates with FLOC – the Farm Labor Organizing Committee, AFL-CIO – with their trademarked, red “Hasta La Victoria” flags, joined the strike line, as did NC State AFL-CIO President James Andrews. 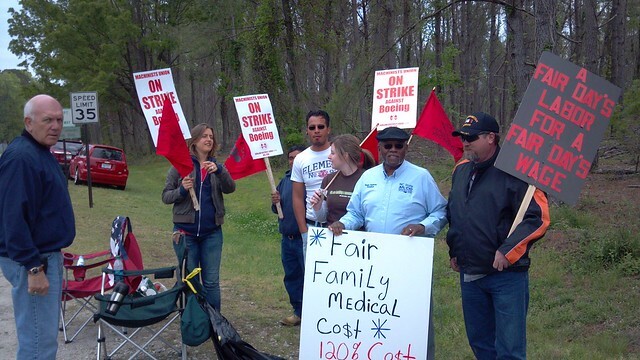 For more information about the machinist strike at Seymour Johnson AFB and how you can help, contact Ron Shafer at (252) 659-2670 or 110dbr@embarqmail.com.